The greater the attendance a student has, the greater the achievement. Students with a high level of school attendance are more likely to benefit from education, achieve better examination results and are less likely to miss out on the multitude of experiences that Ysgol Clywedog provides. Please leave a message stating your child’s name, tutor group and reason for absence. Please call on every day of your child’s absence unless you know your child is going to be off for more than one day. In this case please state the length of absence on your first call. Research suggests that 17 missed school days a year = one level GCSE grade drop in achievement. 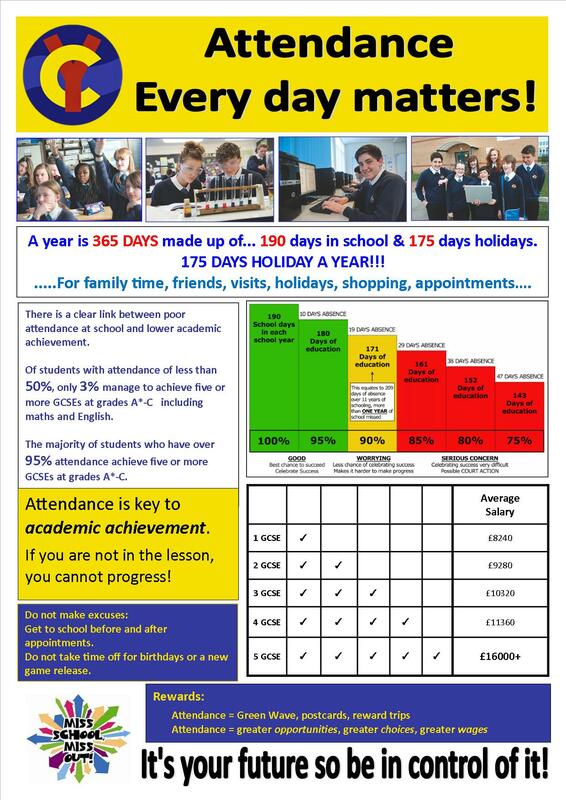 At Ysgol Clywedog every student should aim for 100% attendance. If it drops below 96% attendance, it becomes a concern. Full attendance leads to the best educational outcomes – please give your child the best chance and make sure they are in school every day. Ysgol Clywedog recognise good attendance and the importance to praise students. Verbal praise – using positive language to reinforce and celebrate their attitude to learning. Achievement Points – awarded to those who demonstrate a positive aptitude for punctuality and good attendance. Postcards – given to those who have achieved 95% attendance in any half term. Positive Phone calls – A phone call to parents / guardians to praise the student for their attendance and punctuality. Certificates – presented to the students in reward assemblies for 100% attendance. A lottery of £5 gift vouchers for students with 100% attendance. Trophy rewards for Attendance Leagues between the forms. Ysgol Clywedog has a clear process for poor attendance. For each child who misses a certain amount of school parents/guardians receive three separate letters from the school. If they fail to produce medical evidence an Attendance Improvement Plan (AIP) is put in place which triggers the Fixed Penalty Notice procedure. If attendance does not improve it could result in a fine being issued by the Local Authority.